leaving bowmore on the a846 from the famous round church at the top of main street, i take a sweeping right onto shore street and head towards bridgend. as the village recedes to only the odd cottage here and there, the road hugs the shores of loch indaal on its way to bridgend, a considerably smaller village than that of bowmore. with little more than a church, an hotel and a shop, rolling over the bridge across the river sorn, i take a left onto the a847 towards bruichladdich and port charlotte, all but ignoring the cattle mart on my left..."
this coming monday, bbc one scotland will be commencing a new series entitled hebrides - islands at the edge narrated rather drearily by scots actor ewan mcgregor. though there is the occasional glimpse of human habitation, on the whole, the series concerns itself with the wide range of wildlife that inhabits these rocks in the atlantic all the way from islay in the south to skye, further up the west coast. these islands constitute the inner hebrides, with lewis, harris, stornoway and barra making up the outer hebrides. at this point, though i've seen a preview of the first programme, i've no idea if the latter are included or not. but frankly, this is of no nevermind, for it is islay that is of current concern or interest. as the morose mr mcgregor is less than excited to narrate, one of the perennial features of islay and its neighbouring island is that of the wind. "often reaching 60mph even in summer, the atlantic winds can reach as high as 100mph" you can't say i haven't mentioned this on one or two previous occasions, but if it's on the bbc, it must be true. the corollary of such a consistent weather feature is a propensity for certain herbaceous plants not to survive long enough to grow to adulthood. like trees, for instance. there are, of course, one or two pockets of trees in the odd sheltered spots across the island, but by and large the country lanes, as we rather picturesquely refer to them, are somewhat exposed to the elements. used mostly for agricultural purposes, the surfaces of these are less than billiard-like, meaning the network can hardly be considered as hidden. it would be hard to come across the ideal picnic spot. that, quite frankly, is the difference between my neck of the woods (metaphorically speaking) and that of the more southerly resident jack thurston. mr thurston has been mentioned in these pixels on previous occasions, principally in conjunction with the excellent bicycle reader downloadable at little outlay from amazon. 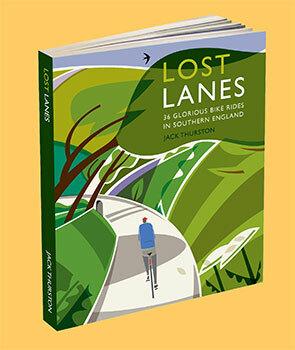 however, aside from his writings in rouleur, he has penned an excellent volume of 36 glorious bike rides in southern england that are as far removed from the roads of islay as chalk is from cheese. for rather obvious geographical reasons, i have investigated not one of mr thurston's delectable routes, all of which are illustrated by way of some superb photography. in fact, i jest not when i say it would be more than possible to leaf through the book's 255 pages, simply to look at the photos. rarely have i read a travel book which eschews every aspect of the parody i used as my opening paragraph. this is most certainly not a guide book in the sense that you and i may have come to expect. "The Thames estuary has always been a moody, mysterious place and a favourite haunt of the new breed of psychogeographers, who appreciate the soulful, brooding drama of post-industrial decay and the abandoned military installations that stand out of the flatlands." "As we approached the turn of our route, just north of Charlwood, the biggest change to the landscape lay right ahead of us: Gatwick Airport. In the 1890s, a racecourse was built here, conveniently located beside the London-Brighton railway, with its own station, so people and horse could arrive by train. After the first world war, land next to the racecourse was used as an aerodrome for a small flying club, and commercial flights began in the mid-1930s." now isn't that the sort of cycling guide you want to read? from the distanced point of my armchair, it certainly exudes great appeal, colourfully illustrated by the previously mentioned luxurious photography. pragmatism has, however, not been thrown out with the bathwater. 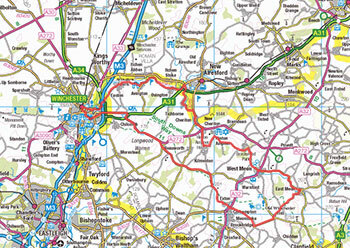 not only is each ride accompanied by a rudimentary map, jack thurston has provided a link to a highly detailed online map that can be downloaded; "this is a weighty book and the last thing anyone would want to do is carry it around for a day's cycling." in addition to such graphical topography, there are gpx files available to load into your gps device for even less-weighty travel. additionally, each chapter ends with a pubs and pit stops detailing local hostelries, tea rooms, coffee shops, bike hire and bike shops. mr thurston, while quite obviously an intrepid local traveller on two wheels, is also an accomplished writer. i cannot recall the last time i found it hard to put down a guide book, even though i would cheerfully contest that lost lanes transcends the genre. no sooner had i finished reading the minutiae of one country ride than i was eager to continue my armchair reverie by turning the shiny pages to the following. if it was imperative that i interrupt my fulsome praise with a criticism of even trivial proprtions, it would be the siting of the chapter before you go - practicalities across the very last pages. this assumes, i fear, that the entranced reader will complete the entire volume before considering setting out on one of the included rides. i doubt i would have waited that long, were i in an appropriate location so to do, and thus may head off into the hinterlands without heeding or reading practical advice that might have obviated any unforseen interruptions. i'd have positioned this chapter at the beginning. and it is at the beginning that thematic cycling is introduced. it is entirely possible to randomly pick and choose from all 36 routes, but it's eminently likely that specific cycling proclivities might be better pandered to by certain of the routes as opposed to others. thus we have best for wild camping, weekends away, gourmets, ups and downs... i'm sure you get the picture. if this were on an iphone, it would be an app. i do hope many of you will watch the bbc series on the hebrides, if only to garner a brief impression of the differences between here and there. similarly, it would be the greatest of mistakes to only consider purchase of lost lanes on the basis of location. i cannot deny that, considering my domicile in the wild, wild west, i would most likely have let this jewel slip through, a mistake for which i would have been very much the poorer. i would implore that you acquire your own copy very soon and revel in a part of the united kingdom that is every bit as intriguing from the armchair as it likely is from the saddle.